… I will practice using mindfulness and visualisation to self-soothe with an exercise in observing my emotions and comforting them with calming colours. This week I will schedule a regular time to practice the exercise and as it starts to feel familiar I will begin testing out how to use it during moments of stress and distress. Mindfulness simply means paying attention to the present moment, one thing at a time, on purpose and without making judgements about what is good or bad. We all make judgements all the time, so we won’t be able to stop doing it completely. But when we are being mindful, we pay attention to the judgements we notice ourselves making, name them for what they are (e.g. ‘I notice myself judging xyz to be something I don’t like’) and bring our minds back to the present moment, rather than being hooked into the judgements we have made. Paying attention to the present moment means we notice or observe what is outside and inside us and we describe it to ourselves in words. Once we are mindfully aware of what is happening inside and outside us, we are able to decide how we want to participate in the moment and what we need to do that – like maybe a bit of comfort. This week, I will spend 5-10 minutes each day, practicing how to use mindfulness and a colour visualisation to comfort the places I feel distress. This is an exercise in three-parts. Body Scan: Sitting still, in a comfortable position, breathing in my natural rhythm.Closing my eyes, I will sit in silence and observe what is happening in my body. Starting at my feet and moving up to the top of my head, I will tune my attention into each part of my body and describe to myself in words what sensations I notice – how hot or cold is my skin? is there pain or discomfort? As I notice other thoughts entering my mind, I will observe these to myself too, and come back to scanning the sensations in my body. Mood Scan: Once I have scanned my body, I will turn my mind to the emotions I am feeling in this moment – observing and describing to myself, each of the thoughts, images, memories and feelings I notice and bringing myself back to what I feel. What is the strongest emotion? Where do I feel it in my body? How does it sit in my body? What temperature and colour is this feeling or mix of feelings? With each question I ask myself, I will observe and describe the thoughts and emotions that arise in response or that pull me away from paying attention to this feeling fully, without judgement and without judging my judgements. Recolour the Mood: Once I have tuned into the strongest emotion in this moment and found a colour that matches it, I will bring to mind a colour that I find soothing. This could be a colour I find peaceful, relaxing, happy, exciting, energising, calming, loving, gentle, supportive. What comes to mind when I think of this colour? What sensations, images, sounds, tastes and memories belong with this colour? I will then turn my mind back to the strongest emotion, where it sits in my body and visualise the colour that goes with it. I will then imagine I have filled a cup with my comfort-colour and am drinking it down, into the part of my body where my strongest emotion lies. In my mind I will imagine re-colouring that strongest emotion with my comfort-colour, seeing it settle more and more, seeing it cool down or warm up as needed, seeing space and tension free up, as I pour more and more of my comfort-colour into that part of my body. I will then open my eyes slowly and bring myself back to the room and the next task in my day. When I notice my mood shift throughout the day, I will practice observing it, noticing where it sits in my body, giving it a colour, finding a comfort-colour and re-colouring that space in my body. Once I am familiar with using this mindful visualisation, I will add ‘Re-colour the Mood’ to my Personal Coping Kete as a way to self-soothe and create space inside myself, during moments of stress and distress. Instead of trying to stay away from what think or feel, and being pushed around by it, I will be able to observe what is happening inside me, where I feel it, and create some comforting sensations inside me. With each wave of sadness, anxiety, anger, frustration, fear or any other kind of stress, distress or upset, I will tune in, observe the feeling and re-colour it with something comforting. … I will create a compassionate self to call on in times of stress and distress. We often have a strong self-critic or even a self-bully that pipes up to tell us all the worst things about ourselves and what we are going through. If we reflect on our self-talk in times of distress we might notice we use blaming, judgmental and sometimes downright mean words with ourselves that leave us feeling ten times worse. Having a compassionate self allows us to use soothing, understanding, non-judgmental, kind and supportive words with ourselves instead of or in response to the self-critic or the self-bully. The first step is to create a character map of my compassionate self. This starts with thinking about what compassion means to me. I will think about what I might need from my compassionate self and what compassion involves for me. Is my compassionate self forgiving, respectful, kind, aware of what is important to me, caring, accepting, humorous or all of those things and more? What does my compassionate self think about making mistakes, flaws, limitations, weaknesses and negative life events? The next step is building a visual image for my compassionate self. What does my compassionate self look like? My compassionate self could look like someone who has treated me this way in the past, a creature I have found comforting or it could look like me when I am being compassionate, understanding and kind. I’ll think about what facial expressions and gestures my compassionate self might make to show their compassion and what it feels like to be near that. How does my compassionate self look at me? Next I need to create a voice for my compassionate self. What does my compassionate self sound like? I’ll think about what tone of voice it uses, what it sounds like, how loud its voice is and how fast it speaks. Finally, I need to create some words for my compassionate self. What does my compassionate self say to me? I will think about what words and phrases my compassionate self uses to soothe, show kindness and be understanding. It’s easiest to do all this on a piece of paper, in writing or drawing, to make it concrete and give us something to come back to later. When I have created a character map for my compassionate self, I will practice using it by taking one to two minutes each morning to sit mindfully and visualise my compassionate self talking to me about the coming day, whatever it might hold. Whenever I notice other thoughts distracting me, I will describe them to myself, respond to them using my compassionate voice and return to visualising talking to my compassionate self about the coming day. Once I am familiar with visualising my compassionate self and responding to my thoughts with my compassionate voice, I will add “Call on My Compassionate Self” to my Personal Coping Kete as a way of coping with stress and distress. I will be able to call on the compassionate part of myself to talk me through stressful times with soothing, kind, respectful and understanding words, ideas and images. My compassionate self can even talk directly to my self-critic and my self-bully when they appear. I might not be able to make those parts of me go away altogether when times are tough, but showing compassion for why they are there and sharing some different ideas with them might make them quieten down. To prepare, I will take some time to write down some of the things that my mind often throws up when I am distressed. I will then name the most repetitive thoughts or the ones that trigger the toughest emotions – there is often some kind of “I can’t cope” story, “bad self” story or “dangerous others” story in the mix. These are tough thought-chains to deal with when we are caught up believing them or struggling against them, especially when they have been ‘true’ for us in the past. Struggling against a story makes our mind keep repeating it. Naming the story and saying ‘thank you brain’ lets our mind know we are aware and reframes the thoughts as ideas and words instead of realities we need to act on – this often lets our mind know it can stop telling the story so loudly. Once I have named some of the stories I notice my brain often tells me, I will practice naming them as I notice them throughout my day. This week, I will pause whenever I move between tasks or situations to practice observing what stories my brain is telling in the moment and saying “Thank you brain, for telling me the xyz story. I hear you.” I will then move forward with my valued direction or do another coping strategy to make things workable. Once I am comfortable naming my mind’s stories and thanking my brain for telling them, I will add the strategy to my Personal Coping Kete as a way of coping during times of stress and distress. Naming and acknowledging the chains of thought will help me to untangle myself from the automatic stories my brain is telling me, quiet them down and focus on the other story about what is important to me. …I will practice expanding to make space for stress, distress and upsets when they appear, rather than tightening up around them and getting stuck struggling against them or having to make them stop. Being human involves a wide spectrum of emotions; I can feel them all and this week I will practice allowing myself to. To begin with, I will pick a couple of anchor-tasks that I do every day that I can use to practice with, like making my morning cuppa or waiting for emails to load. Whenever I find myself doing my anchor-task, I will take a moment to observe my thoughts and moods in the moment by putting words to them, one by one. Breathing deeply, for each observation, I will tell myself “I have space for what is here” and imagine myself expanding around it as I breathe and shift into an open, relaxed posture, releasing any muscles I am tensing. If I notice a struggle to expand around something, I will repeat the strategy with that set of thoughts, observing, describing, making space. After a moment, I will bring my attention back to my surroundings and the task at hand (or what I really need/want to be doing), carrying this sense of space with me. Once I am familiar with using this strategy at a planned time, I can practice using it throughout the day whenever I notice an unwanted shift in my moods, so I start to get used to expanding around stress and distress. Sometimes, part of making space for stress and distress, means soothing it. It might help to respond to distressing thoughts and feelings with supportive self-talk as I breathe and relax around them. Expanding to make space also means accepting what I need and getting those needs met. I might need some self-care or distraction or support to help me, expanding around distress, doesn’t mean I have to carry it on my own or give up on trying to feel better. 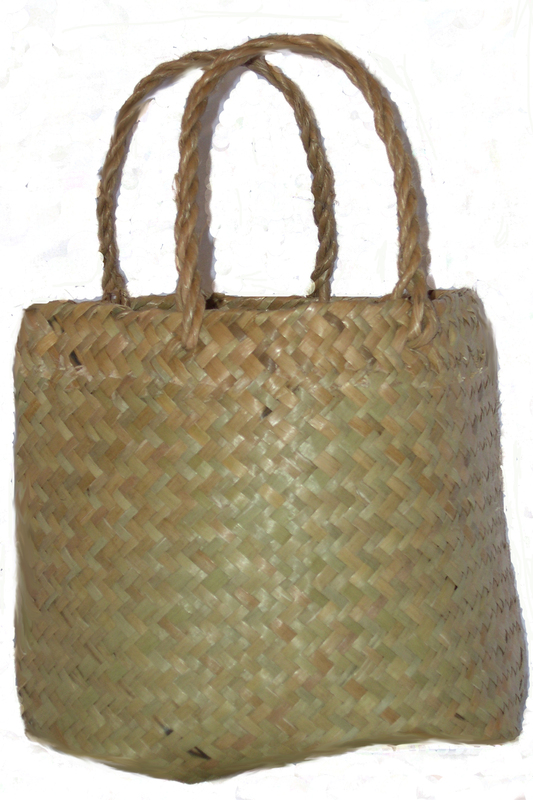 When I am comfortable expanding around stress and distress, I will add ‘expanding to make space’ to my Personal Coping Kete as a way to survive the times when I am struggling. I’ll be able to take a moment of observe my thoughts and moods in the moment by putting words to them. Breathing deeply, I will tell myself “I have space for what is here” and imagine myself expanding around it as I breathe and shift into an open, relaxed posture, releasing any muscles I am tensing. If I notice a struggle to expand around something, I will repeat the strategy with that set of thoughts, observing, describing, making space. After a moment, I will bring my attention back to my surroundings and what I need/want to be doing next, carrying this sense of space with me. 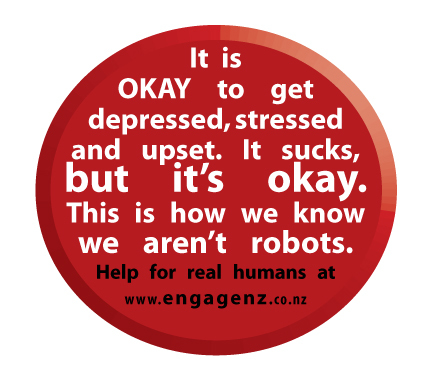 Acknowledgement: “Expansion” is an acceptance strategy found in Russ Harris’s ACT self-help book ‘The Happiness Trap‘. This post is one person’s way of learning and practicing expansion – it isn’t necessarily the right way. When it comes to coping there is almost never a right way. We’ve each got to experiment to make it our own. … I will practice catching my inner critic and responding to my self-talk with kindness. As I move through my week, I will pause each time I notice my mood change and take a moment to observe what I am telling myself about the situation and my feelings. When I notice critical, judgemental or harsh self-talk, I will label the thoughts and deliberately respond with self-talk that is kind, compassionate and supportive towards my situation, my feelings or myself. When I notice supportive self-talk, I will label that too and respond with self-talk that recognises the way I have been able to support myself in the moment and encourages me to keep talking to myself in this way. 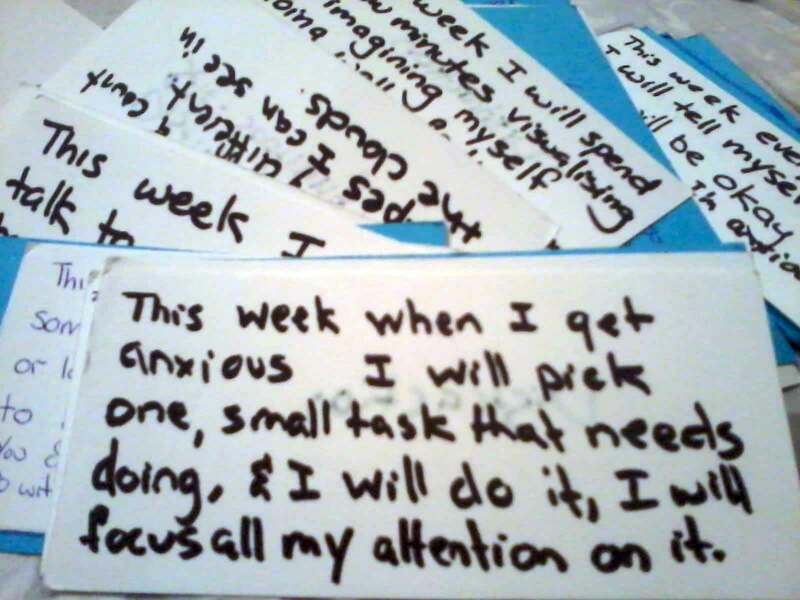 As I move through the week, I will learn to label my unhelpful self-talk and deliberately talk to myself in a way that builds me up instead of cutting myself down. Self-talk is automatic but we can bring it into our awareness and use it to support ourselves through moments of stress and distress. When I am comfortable noticing, labelling and responding to my self-talk with support and kindness, I will add ‘Supportive Self-Talk’ to my Personal Coping Kete for moments of stress and distress. When times are tough, I’ll be able to catch my harsh inner critic and feed myself supportive, compassionate self-talk to balance out my response. Self-judgement adds another layer of distress to already difficult situations. Giving ‘voice’ to my inner supporter can make my distress less intense and easier to cope with. … I will practice choosing the course of action that will make me feel better later by doing something for my future self each day. We so often spend our time caught up in surviving the day-to-day things that lie in front of us, that we forget to spend time setting up our future selves to thrive. This week I will practice nurturing my future self. To start with I will make a list of small things I could do in a day to help me feel better later. Each day, I will choose one thing from my list to do and plan in a time to do it. As I get used to the practice of doing small things for my future self in a planned way, I will practice pausing as I make decisions in my daily life to ask myself what course of action would help me feel better later. In this way I will get familiar with responding to typical daily decisions in a way that nurtures my wellbeing in the long-term. When I am used to making choices for my future self on ordinary days, I will add ‘Do Something for My Future Self‘ to my Personal Coping Kete as a way of coping during times of stress and distress. When I find myself feeling upset, I will be able to distract myself by doing something that will help me feel better later and self-soothe with the idea that my actions will make things easier for me soon. This might help me be able to hold my distress without getting caught up in it. … I will pause once a day to practice being mindful of the present moment and myself inside it. Mindfulness involves paying attention to the present moment on purpose, without judgment and with full awareness of both the internal and the external parts of our experience. I can do this by purposefully observing the present moment, describing it to myself and then participating in the experience. In order to fully observe, describe and participate in the moment I need to focus on one thing at a time, take a non-judgmental stance and be effective. Being effective means choosing the direction that is most helpful or doing what needs to be done without being trapped in our emotions but without ignoring them either. This week I will practice taking the time to observe what is around me and what is inside me. I might need to set an alarm or decide on another reminder ahead of time to help me remember to practice. While I’m new at mindfulness, I’ll practice at a time when my emotions aren’t running super high. Once a day I’ll practice taking a mindful moment. Breathing calmly and moving into a comfortable position, I will focus my mind on the here and now…Noticing what is happening around me right now, I will observe my surroundings and describe them to myself without judgement. When I notice myself making judgments, I will observe them that way, carefully re-word them and return my mind to the present moment as I continue with my breathing. I can ground myself in the present moment by paying attention to my five senses and participating in them with awareness. What do I see around me right now… what do I hear… what do I smell… what do I taste… what do I touch? I will allow my thoughts and feelings to register and come back to my senses. I will name thoughts as thoughts, feelings as feelings, separating the past from the present, acknowledging the things that are unwanted instead of pushing them away. I will observe and describe any thoughts and worries about the past or future that arise, without evaluating them or chasing them. I will then turn my attention back to observing and describing the physical environment around me and how I experience it. Once I have observed the whole of my surroundings and what is going on inside me, I will turn my attention to the next task I have at hand, carrying my wider awareness with me. When I am comfortable paying attention to the present moment at an ordinary time, I will add ‘Mindful Moment’ to my Personal Coping Kete as a way of coping with stress and distress. When I notice my emotions starting to run high, I will be able to pause, ground myself in the present and tolerate my distressing thoughts and feelings without pushing them away. I will be able to observe and describe my experiences for what they are and continue to be fully aware of my surroundings and my senses. Acknowledgement: Mindfulness can be traced back to buddhist philosophy. Thich Naht Hanh is known for creating the Engaged Buddhism movement and popularising mindfulness in the Western world. Jon Kabbat-Zinn is known for popularising mindfulness in the medical community with the Mindfulness-Based Stress-Reduction (MBSR) programme at the University of Massachusetts. Marsha Linehan is known for popularising mindfulness in the mental health community with Dialectical Behaviour Therapy (DBT). The basic practice of mindfulness features in many strategies shared in The Coping Kete. Once you learn the basic skills, you can use mindfulness in any moment you find yourself in, in countless different ways. There is an awful lot behind each of the skills involved. Follow the links above to learn more. …I will practice being compassionate towards myself. When I notice critical thoughts or judgments about myself or things I have done or not done, I will practice responding in my mind with kind words, that share sensitivity for my suffering and respect for my humanity. I will practice choosing compassionate and accepting words to talk to myself about my mistakes, weaknesses, flaws and limitations. Other people can criticise me if they wish, but I will give myself compassion. As I move through my week, I will keep an eye out for self-talk that is harsh, critical and judgmental. 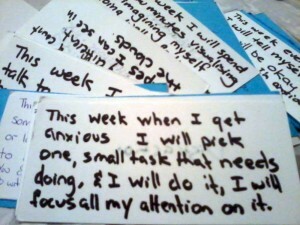 For example, I will watch out for self-talk where I label myself stupid or useless when I make a mistake. When I notice I am labeling myself harshly for my mistakes and limitations, I will give myself compassion by pausing to remind myself it is human to struggle. I will appreciate my strengths by remembering them to myself and recalling that my flaws and limitations are simply part of a whole, not all that I am. By responding to myself with compassion throughout the week, I will practice accepting my whole self, warts and all. I do not need to be perfect, nor would I want to be. When I am used to talking to myself with compassion and acceptance on an ordinary day, I will add ‘talk to myself with compassion’ to my Personal Coping Kete as a way of coping with stress and distress. When I find myself in distress, I will be mindful of how I am talking to myself and be careful to use compassionate words. In times of stress and distress, I will be better able to give myself messages of kindness, instead of giving myself messages of shame or judgement that make me feel worse. … I will practice doing just one thing at a time. I will pick one daily activity, like taking a shower or brushing my teeth, drinking a coffee or eating breakfast. Each time I find myself doing my chosen activity, I will do just that activity, with an awareness of what I am doing in that moment. For example, instead of drinking my coffee while I read emails – I will just drink my coffee and notice the experience in its fullness. I can anchor myself in each of my five senses as a way to practice being aware of what I am doing: sight, taste, hearing, smell and touch. While I notice the activity at hand, I will practice letting my thoughts come and go, without chasing them. My inner world is part of my current experience in any moment and I will allow it into my attention. By turning my attention to the one thing I am doing, I’ll practice not being pulled into other thoughts and feelings, even though I know they are there. As other thoughts enter my mind, I will observe them and my responses to them with kindness, then bring my attention back to the one activity in front of me. Doing one thing at a time, frees our minds up to do that one thing more efficiently. Taking time to do one thing at a time also lets us experience the simple pleasures of everyday things more fully. Practicing doing one thing at a time and focusing my attention on the task during everyday activities, will help strengthen my ability to focus my attention on mindful distraction tasks during times of distress. 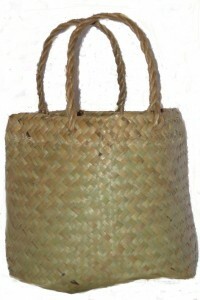 Once I’m used to the art of doing one thing at a time, I will add it to my Personal Coping Kete as a way of coping when the going gets tough. When I am feeling overwhelmed by emotions or unwanted thoughts, I will choose any small activity I can find to do and I will focus my awareness on that for a while. I’ll observe my thoughts as they float to the surface of my attention, notice my responses to them and then turn my mind back to doing the one activity before me and experiencing it fully. It could be anything from dusting an ornament to making dinner. Whatever I choose, I will do just that one thing and I will pay attention to every part of it. … I will practice being mindful of the wider moment by pausing as often as I can remember and simply being still. Throughout the day, wherever I am when I remember, I will stop what I am doing, be still and just breathe. Whatever is going through my head, I will notice and let pass, while I breathe and be still. I will take this time to notice the light and temperature and textures around me and the sensations in my body as I stop what I am doing and settle into the moment. When I notice thoughts I will practice noticing them kindly, without judging them. I will practice letting the thoughts I notice pass by looking at what else there is to notice in this moment. Moving my awareness on will help me make sure I don’t get hooked into one particular train of thought. If I notice myself making judgements, I will observe the judgement and again move my awareness to what else I notice while I am breathing and being still. In this way, I will practice having little rest spots throughout my day, where I can slow down and notice what is happening inside and around me, without getting hooked into the stressful stuff. Taking moments to slow down and be still might help me be aware of what am dealing with, while I allow myself to be mindfully distracted by my surroundings. After a little while of being still and breathing, I will carry on with what I was doing. When I am comfortable stopping to be still and breathe in everyday moments, I will add it to my Personal Coping Kete as a strategy for times of stress and distress. When I notice I am getting wound up, I will be able to stop what I am doing, be still, breathe and look around me to get a bit of soothing space between feeling and responding. 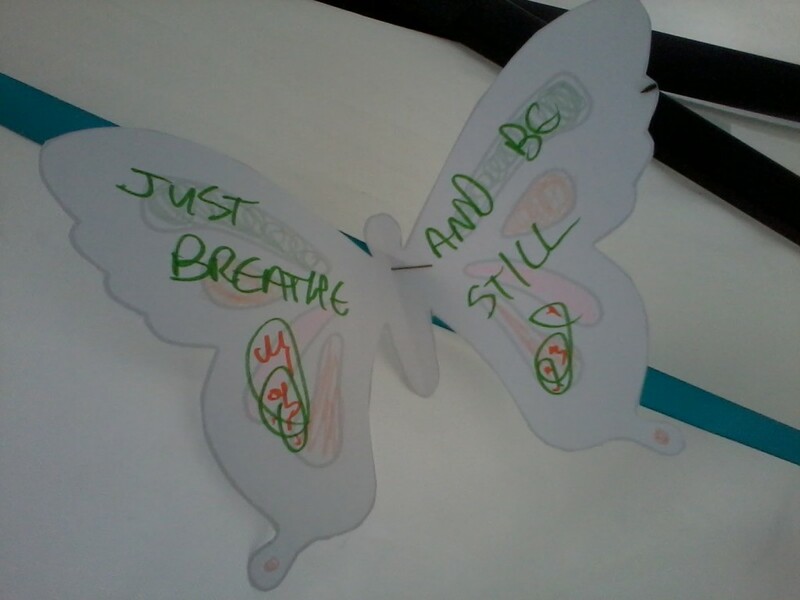 This week’s Coping Kete strategy is inspired by a strategy from a member of the public who attended The Butterfly Diaries launch during Mental Health Awareness Week.